Restaurant chains such as Burger King, Pizza Hut and Taco Bell add to their value strategies in the new year. Value is often top of mind in early January among restaurant customers who have resolved to save or better manage their money in the new year, but restaurant brands looking to capitalize on this show that enticing value strategies are about more than just low prices. While some chains have moved up their well-known value promotions opportunistically into January — notably Subway, which is running its $5 foot-long campaign as “Janu-ANY” — others have introduced new value plays that de-emphasize prices in favor of new-product news or brand highlights like anniversaries. As such, operators ought to consider looking beyond price points to signify value, Tristano said, whether it is the service experience, customization, culinary credibility, ingredient variety, or special preparations like slow-cooked barbecue or rotisserie chicken. In the quick-service segment, where much of the marketing emphasis consistently has been on value for the past several years, the largest chains are approaching their messaging through the lens of new-product news. Miami-based Burger King rebranded its value menu as King Deals, a tiered value menu starting with items for $1, including current limited-time offers the Rodeo Burger and the Rodeo Crispy Chicken Sandwich. The menu has 20 items at those lower price points at Burger King’s domestic locations, which comprise about 7,400 restaurants in the United States and Canada. 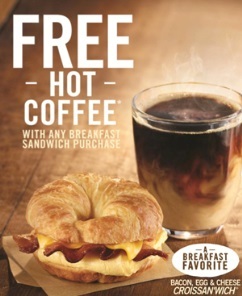 Also, from Jan. 6-29, Burger King will offer a free small coffee to any customer who purchases a breakfast sandwich. Wendy’s, the Dublin, Ohio-based chain of about 6,500 units, also added spicy sandwiches to its Right Price Right Size value menu, which it debuted last year just after New Year’s Day. The Spicy Chipotle Crispy Chicken and Spicy Chipotle Jr. Cheeseburger sandwiches are priced at a suggested 99 cents. Irvine, Calif.-based Taco Bell, also a Yum! Brands Inc. subsidiary, rolled out two value promotions before the new year, including the Grilled Stuft Nacho and the BCS Taco 12-Pack, both of which debuted Dec. 19. The nearly 6,000-unit brand called out the $1.29 price point for the Grilled Stuft Nacho in the commercial that began running in December, but convenience and portability have been the main emphasis in the ad and its complementary social-media campaign. Taco Bell is managing a social campaign under the “#DoingStuff” hash tag, where people take photos or videos of themselves doing anything while eating a Grilled Stuft Nacho. The BCS Taco 12-Pack carries a $12.99 price point and lets consumers choose 12 tacos from among the brand’s crunchy-taco flavors. The price war continues for major pizza chains, but both Pizza Hut and Papa John’s Pizza have added a different angle to their start-of-year marketing campaigns. Both are tying a limited-time, low-price offer to a brand anniversary, allowing them to easily end the promotion without setting an expectation for a repeat performance every year. Plano, Texas-based Pizza Hut, a division of Louisville, Ky.-based Yum! Brands Inc., is offering 50 percent off medium and large pizzas ordered online at menu price for its Hut Lovers loyalty club members. New members of Hut Lovers may sign up and immediately redeem the offer, which will run through Jan. 10. The impetus for the promotion is the anniversary of the first Pizza Hut order taken over the Internet, in Santa Cruz, Calif., in 1994. The chain of 14,000 restaurants worldwide has resurrected its original online-ordering hub from that year, PizzaNet, which the brand said produced the first thing ever purchased from the Internet. “We want to celebrate the fact that before consumers could buy books, clothes, music or vacation packages via the Internet, they could place an online order for a Pizza Hut pizza,” Carrie Walsh, chief marketing officer for Pizza Hut’s U.S. division, said in a statement. Pizza Hut’s commercial promotes the deal by harkening back to 1994 with one of the most popular songs of that year, “The Sign” by Ace of Base. Louisville-based Papa John’s is taking customers back a decade further with its deal to celebrate its 30th anniversary. Through Jan. 26, consumers can add a large one-topping pizza for 30 cents, with the purchase of a large pizza at regular menu price. Papa John’s has 4,300 restaurants worldwide. Technomic’s Tristano noted that fast-casual concepts by and large do not run aggressive promotions in January or throughout the rest of the year, but those chains nonetheless could bolster their value perceptions through product news like other limited-service brands have done. Reconsidering ways to provide more value could be the way fast-casual brands make better inroads at the dinner daypart or with certain demographic groups, like women or Hispanics, Tristano added. Women tend to look for smaller portions, which fast-casual brands could offer, even at a slightly higher price point, he said, while Hispanic customers tend to focus on family occasions when dining out. Both look for bolder, spicier flavors, he said. This entry was posted on Monday, January 27th, 2014 at 8:31 am and is filed under Financial Activity, Future Plans/Announcements, Price. You can follow any responses to this entry through the RSS 2.0 feed. You can leave a response, or trackback from your own site.